Today we have a modest little orchid with the delightful attributes of being easy to grow, quick to propagate and blooming throughout the year. 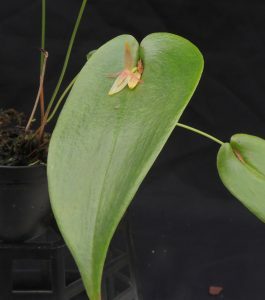 Pleurothallis stenosepala is native to wet forests all down the Andes from Venezuela to Peru and is found at altitudes from 1100-2600m. We grow plants in our Cool Americas section where it thrives in small pots, baskets and mounted. It produces attractive heart shaped leaves up to 7cm long and these produce successive flowers at the leaf axils. Plants freely produce keikis on older leaves that can easily be separated as new plants. As a result this is one of the first species we give to new students joining the orchid project and many have plants growing well on their windowsills at home. We have to keep an eye out for plants growing as ‘weeds’ on other orchids where keikis have fallen and made a new home for themselves – what a nice problem to have.